This Vinsetto commercial storage cabinet with adjustable shelves is an ideal solution for keeping all of your business, work, and personal supplies all in one place and secure. It has 4 adjustable shelves and a key lock for security. Cold rolled steel construction means it’s anti-corrosion and moisture-free for years of worry-free use. Store all your things and stay organized in any environment with this reliable multi-use utility cabinet from Vinsetto! ✔ INDUSTRIAL DESIGN: This freestanding utility storage cabinet with adjustable shelving has a look and function that makes it perfect for the home, office, garage, workshop, school, and more. 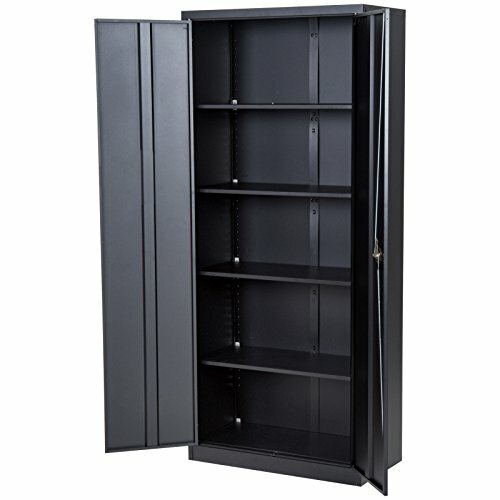 ✔ PLENTY OF STORAGE: With 4 adjustable shelves, our storage cabinet unit offers ample space for home and industrial supplies of all kinds from hand tools to office supplies. ✔ DURABLE CONSTRUCTION: This solid steel storage cabinet has a reinforced base that keeps your unit sturdy and can hold up to 88 lbs. per shelf. ✔ LOCKABLE & SAFE: The cabinet features a key lock to help keep files and important documents as well as your personal belongings safe. ✔ WALL MOUNTABLE: There are 2 built-in openings on the back which allow the cabinet to attach to the wall to prevent it from toppling over.